It’s a good thing Ovie got knocked out of the playoffs so he can support his girlfriend. And judging by the minutes he was getting in the playoffs she will need to support him financially soon enough. Seriously dude, standing in the middle of the road?!?! They will let you get closer to the Arc de Triomphe, you are a super star after all – or at least you were a super star. The Carolina Hurricane Ice Girls are Taking Part in Movember, and I Kind of Like it. This is the first, and last time a lady-stache will work for me. Paulina Gretzky is Pretty Good at Twitter. It's funny because he was in Jail. Jail. He was in Jail. Jail. 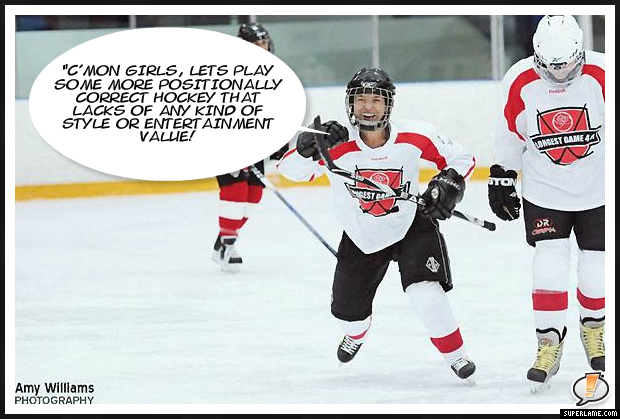 40 Women are trying to enter the Book of World Records by playing a 243 hour long game of hockey. Ugh. The Only Time in the History of the NHL when being Traded to Columbus could be Considered a Good Thing.